Hygienic equipment for the food, dairy, beverage, pharmaceutical, personal and home care industries. Today, sustainable development is high on all industries' agenda. In Alfa Laval, we are committed to continuously improve our products and services to provide you with an opportunity to reduce your operation costs whilst improving environmental performance. 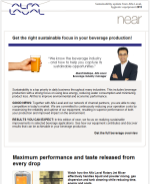 To keep you updated on important sustainability issues and opportunities in your industry and processes, we are launching our near newsletter which will come out monthly with focus on: Energy savings, efficiency gains, water savings, process optimization, and more! 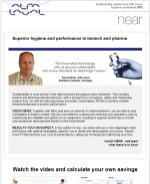 Improve your performance, getting the most out of your raw material and delivering safe products are essentials throughout all hygienic industries and applications. This will save you money and improve your sustainable environmental performance. 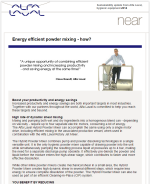 Boost your productivity and energy savings, increased productivity and energy savings are both important targets in most industries. 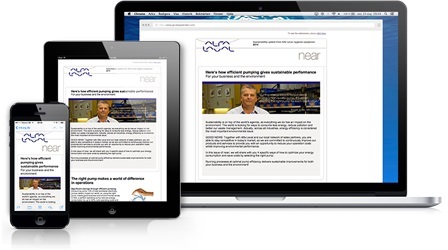 Together with our partners throughout the world, Alfa Laval is committed to help you reach these targets and beyond. 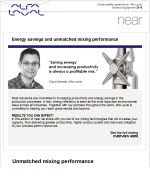 In this edition of near we share with you two of our mixing technologies that will increase your capacity, thus delivering greater productivity, higher product quality and improved utilization of your process plant’s resources. Sustainability is a top priority globally, as everything we do has an impact on the environment. The world is looking for ways to consume less energy, reduce pollution and improve our waste management. 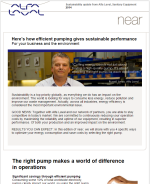 Selecting the right pump for each application is the key to significant savings. 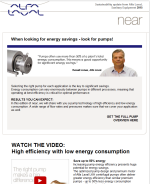 Energy consumption can vary enormously between pumps in different processes, meaning that operating at best efficiency is critical. 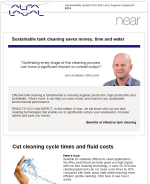 Effective tank cleaning is fundamental to ensuring hygienic production, high productivity and profitability. 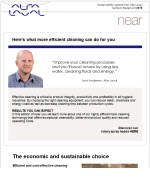 What’s more, it can help you save money and improve your sustainable environmental performance. 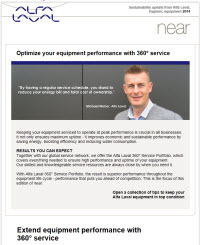 In this edition of near you will learn more about one of our highly efficient tank cleaning technology that offers exceptional cleanability, better end-product quality and reduced operating costs. 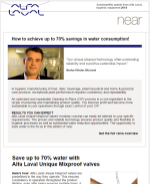 Alfa Laval Unique Mixproof valves' modular concept can easily be tailored to your specific requirements. The proven and reliable technology ensures product quality and flexibility in hygienic processes as well as substantial water reduction opportunities. 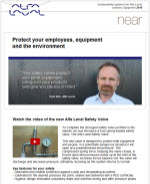 To complete the strongest safety valve portfolio in the market, we now introduce a true spring-loaded safety valve: The Alfa Laval Safety Valve. 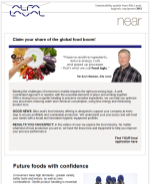 Results you can expect: In this edition of near we will share with you a unique technology and a design that handles all applications. 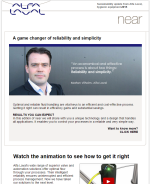 It enables you to control your processes in a reliable and very simple way. We constantly strive to advance heat transfer technology in order to stretch the limits of performance and open new possibilities. 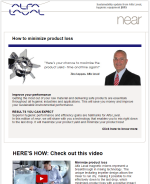 In this edition of near, we give you a technology that ensures high performance with gentle product treatment, longer operation times and superior cleanability - all in one. 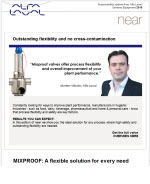 Consistent flow and controllable product quality are both critical and sometimes difficult factors in a process. 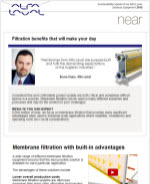 Membrane filtration can be used in many different industries and processes and may be the solution to your challenges. Sustainability is a top priority in daily business throughout many industries. This includes dairy production with a strong focus on using less energy, reducing water consumption and minimizing product loss. With a strong focus on gentle handling to preserve sensitive ingredients, we can help you optimize your processes reducing water and chemical consumption, using less energy and minimizing product loss. 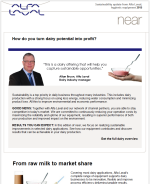 Sustainability is a top priority in the daily business throughout many industries. 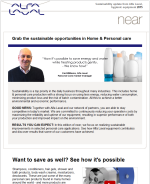 This includes home & personal care production with a strong focus on using less energy, reducing water consumption, minimizing product loss and the risk of batch contamination. Sustainability is a top priority in the daily business throughout many industries. This includes biotech and pharmaceutical production, with a strong focus on hygiene, safety and minimizing product loss, as well as reducing energy and water consumption. Whether you are in the food, dairy, beverage, pharmaceutical or home & personal care industry, the best way to ensure that your processes continue to produce top results is to use genuine service solutions. It's ultimately the most economical choice that effectively protects the operational reliability of your plant, maximizing uptime. Read more: Take a closer look. You won't be disappointed. 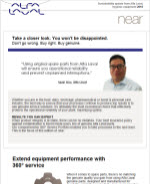 Keeping your equipment serviced to operate at peak performance is crucial in all businesses. Not only does it ensures maximum uptime - it improves economic and sustainable performance by saving energy, boosting efficiency and reducing water consumption.